Mr. J's new haircut - MOHAWK! What a great haircut, wish I had enough left to try this! Oh WOW! Great Summer haircut! I see a lot of boys getting this done for the summer. The neighbor boy right behind me has had his cut like this just a few weeks ago. It's nice and cool for them! Oh my Gosh! Too cute! That is a great summer haircut! He will feel "cool" in every way! Love it! Oh my that is a fun haircut for a boy! Also might as well do this while young. He is so proud of it! Looks great! My boy had a mohawk way back, then someone introduced him to color hair gel. Red, blue, green...he was so proud!! Love it!! He's totally rocking that look! That is a wicked cool cut! Love the haircut!! now he needs to colour it up, if I had a boy I would totally do this to him, I think it's awesome!! i wish i had hair that i could style like that! Bailey Dexter Fun hair cut! great for summer. Sweet! 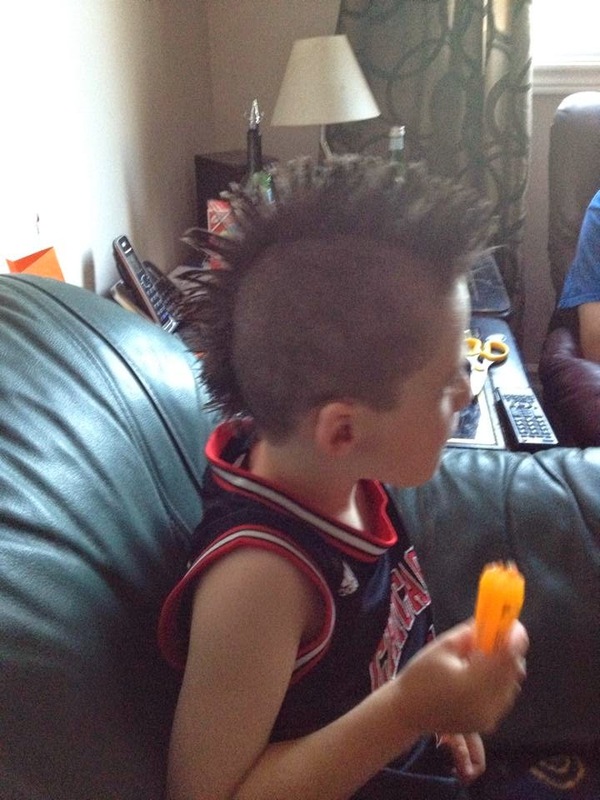 I once gave my brother a mohawk but we only got it to stand up a few times because we couldn't find a strong enough gel or hairspray. Cool hair! So much style and fun. Love it! My little guy hot a shorter style Mohawk today.